Rain on the weekend is usually a bummer. But after a 12 hour shift of manual labor on Saturday, a rainy Sunday is somewhat of a blessing. I intended to catch-up on some yard work and clean up the work area from Saturday’s project, but just as I started, the rain began to fall. Being forced inside was a bit frustrating at first, but a relaxing day inside grew on me pretty quickly. However, for kids, a day inside is the antithesis of relaxing. I’m not sure if we get lazier as we age, but parents clearly don’t share the same level of energy as kids. And when they are locked inside with limited options for entertainment the pent up energy begins to build. By 3PM the built up energy is ready to explode. Signs of nervous energy begin to grow. The feet start tapping. The body starts to move. Spontaneous dancing. Lots of spinning in circles. Attempts are made to turn furniture into trampolines. Eventually it leads to pestering the parents looking for something to do. The Princess started her Sunday lock-down with all of the above, which eventually led to following the Dude around the house, primarily hanging off my clothes, but also telling the same jokes over and over. And I use the word jokes loosely. It was mainly the Princess hiding where I can see her and then jumping out to scare me. Clearly we needed some activities. After listening to “I want that,” following every commercial, it occurred to me to have The Princess create a letter/list for Santa. Yes, I know it’s only October, and don’t get me started on the concept of Santa, but from a practical perspective, I see the value in kids using their imagination, this will give her time to think through what she’s asking for, and most importantly, this will easily kill an hour in lock-down. However, prior to starting this process, the Dude needed to lay down some ground rules. Dude: “Santa likes to bring you gifts that help make you a well rounded person. Like art, music, books, or paints. The Dude is easily dismissed, but I’m also the funding behind Santa, so these were necessary rules. The Princess likes to explain what she wants with vague descriptions like “It’s small, but gets big. And it’s round. And you can play with it.” Any idea what that might be? I have no clue. She also likes to ask for the newer versions of toys she already has that are collecting dust in her room. And lastly, she likes to ask for complete sets of toys. Like every My Little Pony. Do you know how many MLP’s there are? I don’t either, but The Princess does, and she can name each of them. She wants all of them…even though they all look the same, do the same thing (nothing), and an abundance are collecting dust in her room. So, Santa needs some rules. I’m The Princess, and I’m super rad! I have plenty of lipstick. It’s a work in progress, but the process was fun, it gave The Princess a reason to concentrate and think, and it burned some time. All around winner. The thought process definitely burned a bit of energy, but not nearly enough. So, after the Santa exercise, we resorted to the simplest form of rainy day entertainment. 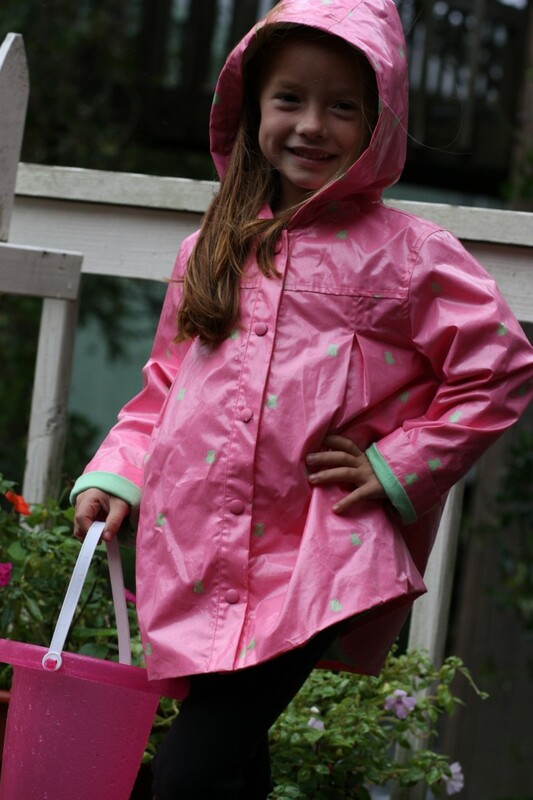 Rain boots, raincoat, and some splashing in the rain. This entry was posted in Princess and tagged board, boot, coat, Dude, kids, letter, list, Princess, rain, rules, Santa, splash. Bookmark the permalink. Just so you know…I also went through the hiding game with the Princess . It went like this, “Nina, I am hiding under the crib, you look everywhere for me except under the crib. After a while, I will tell you when you can find me !” Hmmmm? She did however, give me the very same Santa list that you have, so that is a good sign. I remember when the Sears Catalog kept Mrs. Dude and her sister happy for the entire rainy hurricane season !! Good luck.